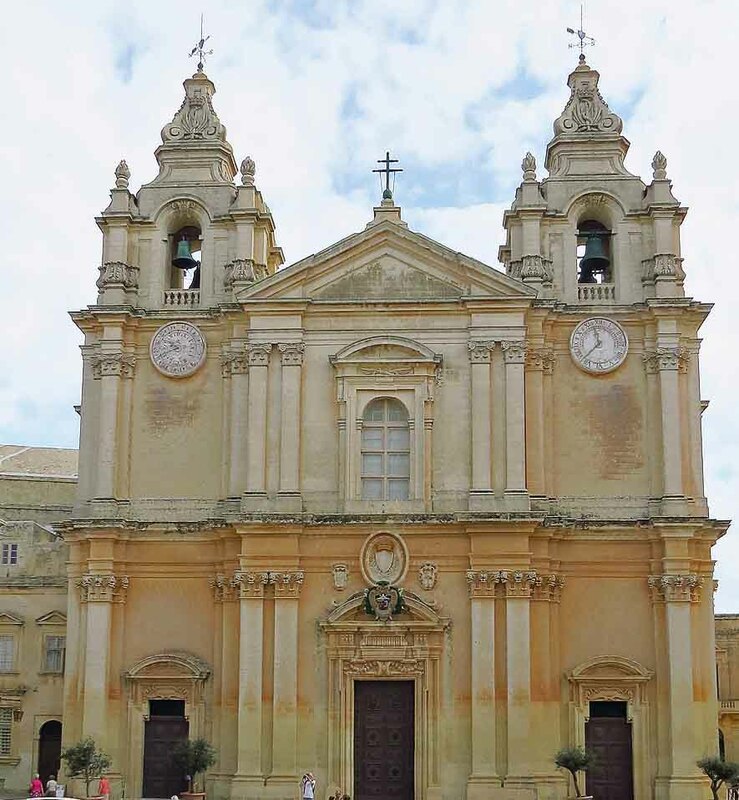 According to tradition, this Cathedral is built on the same spot where, in Roman times, stood the palace of Publius, Governor of the island, whom St. Paul converted to Christianity and consecrated the first bishop of Malta. During the Norman occupation, in the 13th century, a church dedicated to St. Paul was built on that site. The church, which had attained Cathedral status, was modified and enlarged in 1420, but it was extensively damaged by the great earthquake of 1693. Grand Master Perellos and the Cathedral Chapter undertook at once the rebuilding of the church and commissioned Lorenzo Gafa', a Maltese architect, for the purpose. Work started in earnest in 1697 and after five years the new Cathedral was consecrated. The building was in the restrained baroque style very common in post-Reformation Catholic countries. The back apse of the old church, which had survived the earthquake, was incorporated in the new structure. The Cathedral has a balanced facade divided into three bays by Corinthian pilasters, three large portals and two decorated bell-towers. Its superb dome dominates the Mdina skyline. Malta holiday visitors will find it an impressive view from both inside and out. The vaulted nave, 50 metres long, was painted in 1794 by Vincenzo Manino. The choir apse still has the original fresco by Mattia Preti depicting St. Paul's shipwreck in Malta. The nave is paved with marble tombstones commemorating bishops and other prelates. In the side aisles are the tombs of noble families, who enjoy the privilege of burial in the Cathedral. Marble and bronze sepulchral statues adorn the marble walls. These include the effigies of Cardinal Fabrizio Sceberras (1756-1845), Bishop Francesco Caruana and the late Archbishop Gonzi who died in 1984. The chapel of the Holy Sacrament contains an ancient icon showing the Madonna and Child. In the nearby chapel hangs a fine painting by Mattia Preti illustrating an episode relating to 1422, when St Paul, riding on a white charger, is said to have appeared on the bastions of Mdina to chase away Saracen raiders who were attempting to sack the city. The Sacristy door, made of Irish oak and decorated with symbolic carvings, is a relic from the previous Cathedral. Other features for Malta holiday visitors to note include a marble font donated to the Cathedral in 1495, a silver processional cross, (viewed only on special feast days) and a wooden crucifix sculpted in 1648 by Innocenzo Petrolia, a monk of the Franciscan Order. The Mdina Cathedral enjoyed primacy in the Maltese See; but since 1816 it shares this privilege with St. John's of Valletta, which was accorded Co-Cathedral status in that year. THE CATHEDRAL MUSEUM The sumptuous edifice, fronting the south side of the Cathedral, for many years housed the diocesan seminary until it was transferred to Floriana in 1858. The building, which dates from 1729, is a bold expression of baroque art. The imposing facade is characterised by a lofty balcony supported by two oversize stone giants. The fine doorway opens into a spacious vestibule which leads to a graceful courtyard. In 1968, the building was refurbished and inaugurated as the Cathedral Museum. The main exhibits, consisting of paintings, prints and many works of art, were bequeathed to the Cathedral Chapter in 1831 by Count Saverio Marchesi, a French patron of the arts who resided on the island. The vaulted rooms of the ground floor have on display Punic and Roman pottery and glassware, clay figurines and other archaeological objects. In the corridor around the courtyard, there is a series of inlaid panels of choir stalls, dating from 1481. These were originally in the old Cathedral. Other rooms have on display mediaeval documents, historical charters, manuscripts, and papal bulls relating to the Cathedral. A very interesting numismatic collection is on show in another room on the Ground floor. Nearly all the specimens of coins struck in Malta from Carthagenian times to the present day are exhibited. This collection includes gold, silver and copper coins of the U.K. and of other European countries. There are also papal coins and medals. Of special interest is the vast range of coins and medals struck by the knights during their long rule over Malta. All the Grand Masters serving in the island are represented. Coin collectors on a Malta holiday will find this exhibit very exciting and detailed. Four large halls and six smaller rooms on the first floor are devoted to paintings, etchings, church vestments and liturgical art objects. In the central showcases are choral psalters of the 16th century, some rare books and sacred vessels and reliquaries, The picture gallery, which occupies most of the large halls, has on display a number of 16th and 17th century altar-pieces and numerous oil paintings by well-known Italian Masters, and by lesser known artists from other countries. The main hall is dominated by the polyptych of St. Paul Enthroned, of the 15th century Spanish school, which was the altar-piece in the old cathedral. The print gallery takes pride of place in the museum. The spacious hall has on display complete sets of original woodcuts by Albrecht Durer (1471-1578), the eminent German painter and engraver. Copper plate engravings and etchings by other masters are also exhibited. The hall is very well lit, and the prints are skilfully displayed on large, upright wood panels for visitors on Malta holidays. 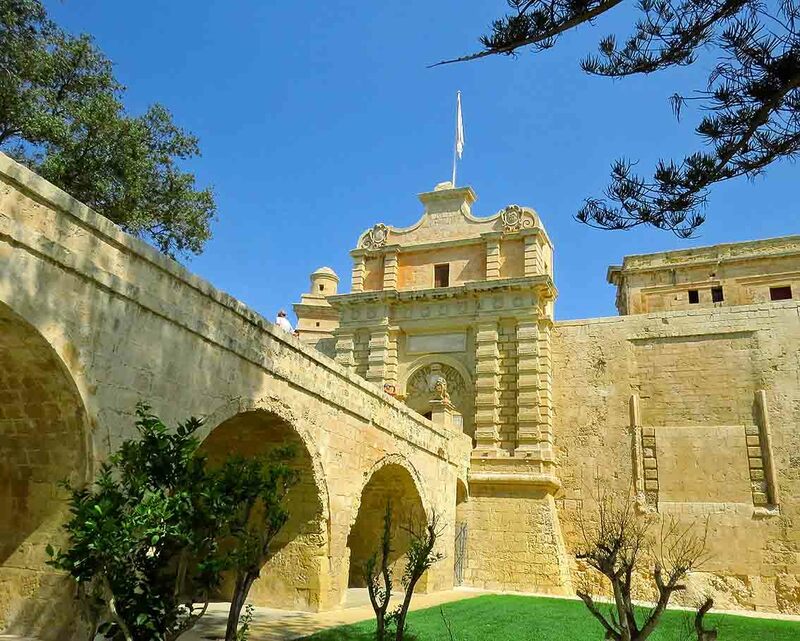 The right-hand wing of the museum building is reserved for the archives of the Church and of the inquisition: these contain correspondence, legal proceedings and other records of the Inquisition in Malta from 1561 to 1798. Most of the objects displayed in the museum were formerly preserved in the Cathedral Chapter premises until the museum was opened in 1968. The museum is run by the Cathedral Chapter. BEAULIEU, a comer house in Bastion Square incorporates part of the Benedictine Abbey of Santa Scolastica founded in 1494. The nuns moved to a convent in Vittoriosa in 1604. This had also been the site of a Jewish synagogue until the expulsion of the community from Malta by the order of King Ferdinand of Aragon and Queen Isabella of Castille in 1492. 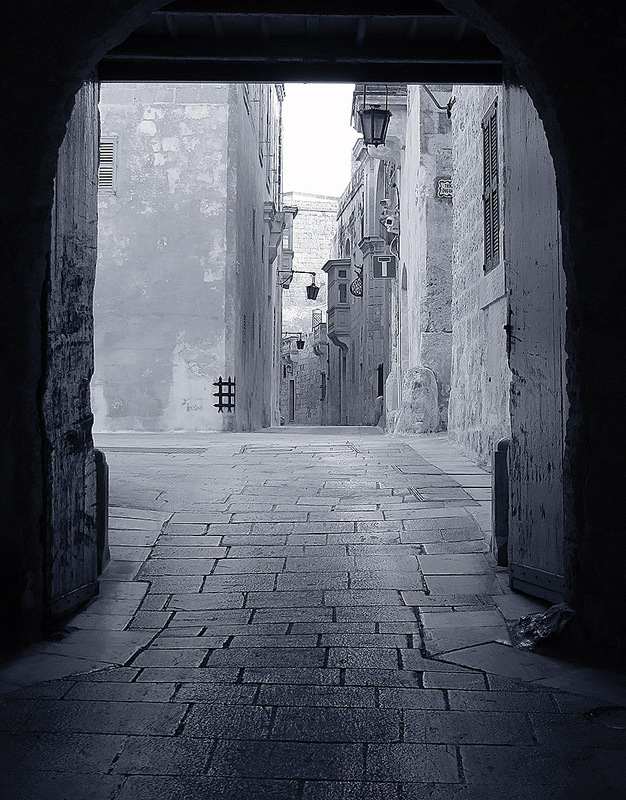 Until then, Jews played a prominent part in Maltese life, and had their own schools, hospitals and cemetry. 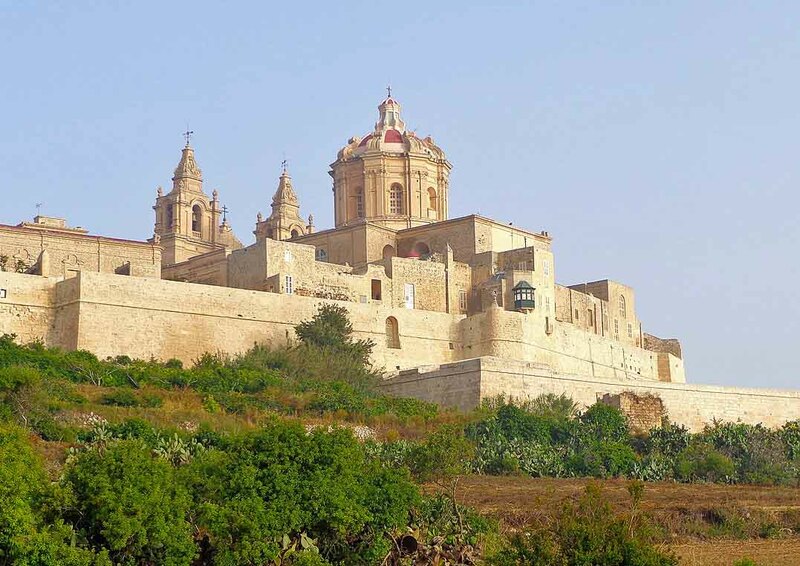 During the siege of Mdina, by Muslim forces under Sinam Pasha, in 1551, the Vicar General was called to the Abbey of St. Scolastica to speak to a nun who claimed to have had a vision. The nun said St. Agatha had appeared and advised that all soldiers and citizens should walk in procession carrying her image, which should be displayed on the bastion wall facing the enemy. The Vicar General acted on this advice and the Muslim forces, impressed by the number of defenders lifted the siege. There are several small chapels of historic interest in Mdina. These include St. Agatha (1417), undergoing restoration and St. Roque (1728), both in Villegagnon Street; St. Nicholas (1550) in St. Nicholas Street; St. Peter's (1580) in Magazine Street, and the tiny Chapel of St. Elizabeth in Inguanez Street. THE BENEDICTINE NUNNERY in Villegagnon Street is of special interest. The Benedictine community was founded in 1418 and the building had previously been used as a Hospital for Women. The Convent Chapel of St. Peter is as old as the Nunnery and was extensively restored in 1625. Its altarpiece of the Madonna and Child with St. Peter, St. Benedict and St. Scolastica is by Mattia Preti (1613 - 99). Religious Malta holiday visitors will find plenty of beautiful places to see.